This has taken place to some extent – the Commission’s Law Reports of its cases formed a key component of the ICTY’s work, for example – but other documents, such as the UNWCC’s own history, or the contents of its conferences, have gone underused. This page aims to gather the UNWCC’s own documentation about itself. 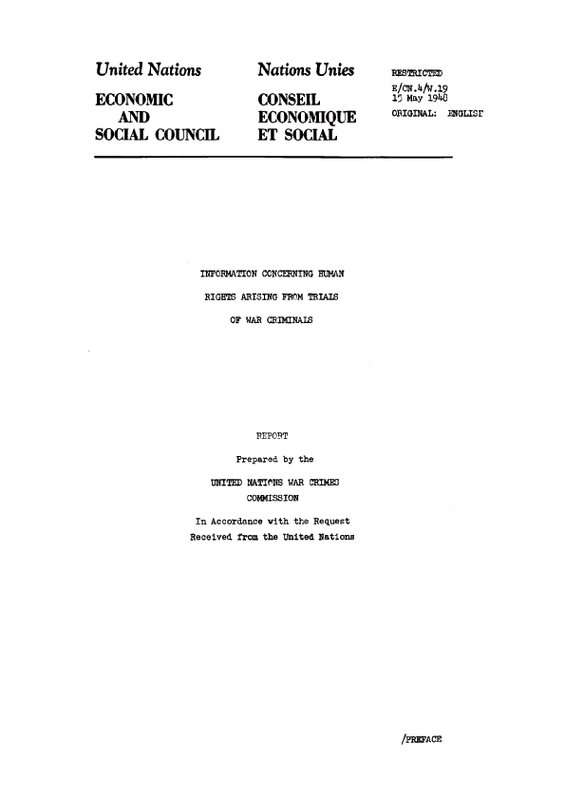 In March 1948 – the same month the Commission was closed down – the UNWCC produced a comprehensive history of its activities and the legal developments in the field of war crimes that led up to its foundation. A fully searchable version of the file can be found here; pdf files for the individual files can be found below. These fifteen volumes of cases represent some of the more high-profile cases handled by the UNWCC, and deal with a wide range of important cases. Unlike the vast majority of the UNWCC’s caseload, these cases have widely disseminated and well-known throughout the international legal community, and have provided significant legal precedents for a significant number of subsequent cases. Even as political stresses were undermining the success of the UNWCC, it was also planning for the future. The newly-emerged Economic and Social Council (ECOSOC) requested a report on the implications of postwar international criminal justice for the burgeoning field of human rights. The UNWCC responded with a report detailing the human rights issues raised by the prosecutions of war criminals – both the implications of the trials themselves (what were the standards for a fair trial, what laws were applicable in this context, and other questions that would be the foundations for international criminal justice in years to come), and for human rights more broadly (what kinds of atrocity would need to be covered under international law, and what kinds of crimes human rights would need to protect against). You can get access to the report here. Check out the front page of the UNWCC’s report on Human Rights, here. In May 1945 – towards the end of the war – representatives of all sixteen national offices that worked with the Commission met to discuss the project of coordinating and giving impetus to the unprecedented set of war crimes trials planned. As well as being an overview of the Commission’s own plans and approaches at a critical point, it also illustrates some of the roles that individual states played and their relationships – including the major role of India in developing this early important period of international law.